For those of us who are flower lovers, the long, cold months of winter can seem particularly barren and colorless. A wonderful cure for these wintertime blues is a colorful sneak preview of spring blooming right on the windowsill - a fragrant, showy pot of paperwhites, or perhaps the more stately beauty of the amaryllis. Both of these flowers bring cheer to the soul in mid-winter, and are especially easy to grow. Unlike other spring bulbs, they do not need a cold period to be forced into bloom in the winter. Simply pot them up and watch them grow. Paperwhites are traditionally grown in pebbles. Choose a low pot with no drain hole, and fill the pot half way with pebbles. Nestle in the paperwhites and fill in with more pebbles. The tips of the bulbs should be showing. The pot should be placed in the dark until the roots have formed and then moved onto a sunny but cool windowsill. Cooler temperatures will promote a sturdier plant and a longer bloom time. Keep the pebbles moist. The whole process takes about six weeks. A pot started on New Years' Day should be blooming by Valentine's Day. Try potting some bulbs every couple of weeks for a long series of blooming plants. After they have finished blooming, the bulbs will not re-bloom and should be discarded. 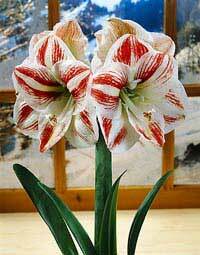 Amaryllis flowers can be eight inches or more in diameter and make quite a dramatic show. They bloom in many colors: white, pink, red and bi-colors. Unlike paperwhites they will grow and bloom for years if given proper care. They should be potted in a good rich potting soil with excellent drainage. The flower stalk appears first and then the foliage. After the flower is spent, fertilize with a high phosporous fertilizer and allow the foliage to grow. When it begins to yellow withhold the water and allow the bulb to go dormant. About a month before you want it to bloom, start the process over again. In this way you can have blooms winter after winter.